The Catonsville Cooperative Preschool offers programs for children who are two, three, and four years old at the start of the school year. Our Two's Program is a parent participation class. A teacher leads the class and the parent or caregiver attends with the child. Our preschool program is for children turning three by the beginning of the school year and our Prekindergarten program is for children turning four by the beginning of the school year. Both our Preschool and Prekindergarten Programs are cooperative classrooms. A teacher leads these classes and parents and caregivers assist in the classroom on a rotating basis. The most important goal of a preschool education is to help your child develop a positive self-image through love and guidance. Our philosophy is that children learn best through play. Based on more than 70 years of experience, we know that with us your child will learn to use his or her body effectively, cope with feelings, get along with others, solve problems, and satisfy his or her curiosity. We provide a rich variety of play materials, same-age playmates, and a curriculum based on children’s intellectual, social, and emotional needs. 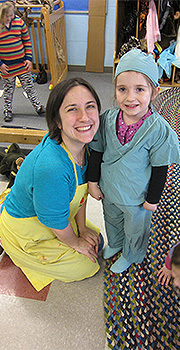 At Catonsville Cooperative Preschool, mutual acceptance and celebration of our differences is encouraged. A warm and accepting atmosphere which emphasizes each individuals' strengths and abilities. Emphasis should be placed on process rather than product so that each participant will view school as a successful experience. Freedom within limits. Young children need the security of knowing that their needs will be met, their feelings recognized and respected. They also need to learn to recognize and respect the needs and feelings of others. Parent participation in planning and carrying out the day's activities. A cooperative program involves three-way sharing among teacher, parents, and children. It is the teacher's responsibility to provide guidance in understanding how young children grown and learn. A child-sized world. Because the child learns through the medium of play, both indoor and outdoor equipment, supplies and materials, and spatial arrangement should be scaled to the size of the child. A program which achieves a balance between cognitive and affective skills and activities. Young children come to school with bodies and emotions as well as brains. They will accept almost anything but should not be subjected to programs which stress one aspect of development at the expense of others. The experience in preschool must be valid for young children as they are, and not just as preparation for later schooling. An environment which is so rich and varied that any choice on the child's part is valuable. Mrs. Ellen Price begins a cooperative kindergarten in her home on Summit Avenue (and later on Rosewood Avenue) to help meet the needs of her bright young son Bill. A group of Catonsville parents offers to fund a non-profit cooperative kindergarten if the Baltimore County School system will provide housing in a school facility. Their petition is denied. The Catonsville Cooperative Kindergarten is established and 38 students attend in two sessions at the Baptist Church on Ingleside Avenue. The Catonsville Kindergarten Association is incorporated. Mothers act as assistants to the classes' teachers. Fathers build furniture for the classrooms. The kindergarten moves to larger quarters in the Catonsville United Methodist Church (the Coop's current location). A vote by the membership to close the school (due to the wide availability of public kindergartens) is amended to instead convert the kindergarten to a nursery school (ages 3-5) and reincorporate as Catonsville Nursery Association, Inc.
Kindergarten is once again added in afternoon sessions to the program through the Catonsville Nursery Association. Inc.
Due to low enrollment, kindergarten sessions are again closed. The nursery school continues to flourish. 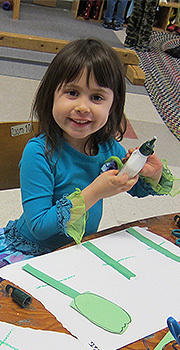 Catonsville Nursery Association, Inc. becomes Catonsville Cooperative Preschool, Inc. Five classes for two-, three-, and four-year-olds are offered.